Chef Monica Galetti is opening her long-planned first restaurant, Mere, in Fitzrovia on Monday March 6, alongside her sommelier husband, David Galetti. It is named in tribute to her mother, Mary — Mere in Samoan, as well as being French for mother. The Samoan-born chef trained in New Zealand before joining Le Gavroche in 1999, rising to the position of senior sous chef. It was there that she met David. 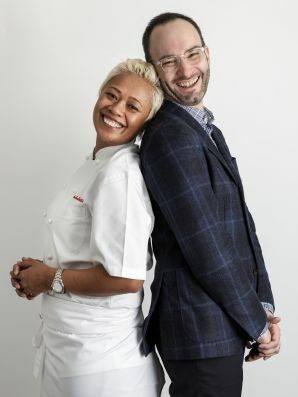 When she made the decision to leave Le Gavroche after 12 years, in March 2015, the first person she told was Michel Roux Jr. She had harboured the ambition of opening her own restaurant since the age of 21. The author of two cookbooks, Galetti became known to a wider public with her appearances on TV as a judge on MasterChef -The Professionals from 2009. The new restaurant, in Charlotte Street, is backed by Alastair Storey of Westbury Street Holdings, which owns the catering companies BaxterStorey, Benugo and Searcys. The menu will be an eclectic mix of a lighter take on classics with new dishes developed by Galetti in the last year, backed up by an ambitious wine list, aimed at providing both business lunches and full-on foodie experience..
News, Newsletter david galetti, Fitzrovia restaurants, Harden's, Le Gavroche, MasterChef: The Professionals, Mere, Michel Roux Jr, Monica Galetti, new London restaurant opening, new london restaurants, westbury street holdings. permalink.